Usually, we find random posts on Social Media regarding Black Friday sales and post them as and when we see them. However, this year we thought it might be useful to produce a condensed and brief summary of the best deals we have seen over the last week or two. Below is a list of the best wallet emptying sales we found on the ‘interwebz’ thus far with associated links and a brief summary. We apologize in advance if your bank account suffers as a result! The list is not fixed, there are always new deals popping up so stay tuned on our FB page for any further sales that crop up. If you find any cool deals feel free to also add them in the comments section below. Update – these deals are now over for 2018 and some links have been deleted as the page son the client sites for BF sales have gone as well. This one surprised me in a good way. The recently launched RE2000 Silver and RE800 Silver got a 50% off promo for Black Friday & Cyber Monday. This could well be the best deal that I know off right now and you can order right away. They are also offering 50% off on the Edition S, RE600, HE400i, and the Mega/Super Mini DAPs so plenty to choose from. 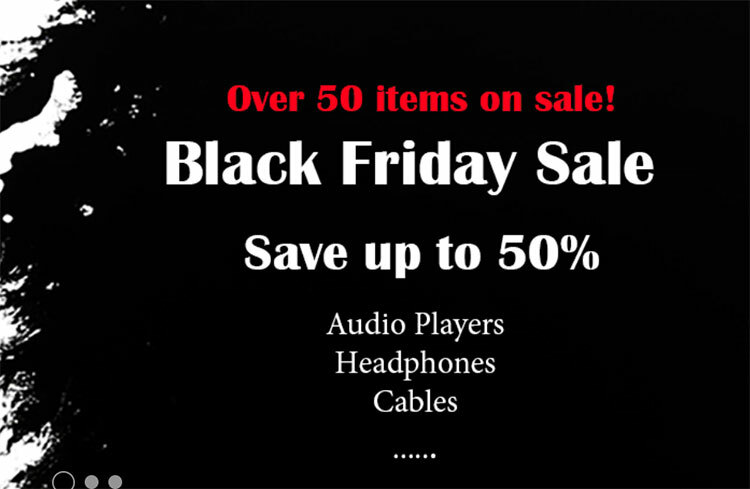 You can find all the deals for Black Friday at the Hifiman Store by clicking here. Musicteck US is a specialist distributor and dealer in a lot of quality product names such as Unique Melody, Cayin, Lotoo, HibY Music and Shanling to name but a few. They do some awesome Black Friday deals every year and 2018 is no exception. This year they have a dedicated page to Black Friday and the promo is now open through Cyber Monday so you can order right away. Awesome deals include $300 off the Effect Audio Janus Dynamic & Basso cables, $700 off the Unique Melody Mason V3, and $700 off the incredible Opus#2 DAP to name but a few. US-based Clear Tune Monitors or CTM just launched their Black Friday sales. From Nov 19th all the way through Nov 26th you’ll get 20% OFF your order on Custom In-Ears, Premium Cables and Bluetooth Cables. CTM is also offering a generous 40% OFF any Vintage Series Universal Fit in-ear. You can check out our VS-4 review here to see if that deal is ideal for you. You can find all the deals for Black Friday at the Musicteck store by clicking here. 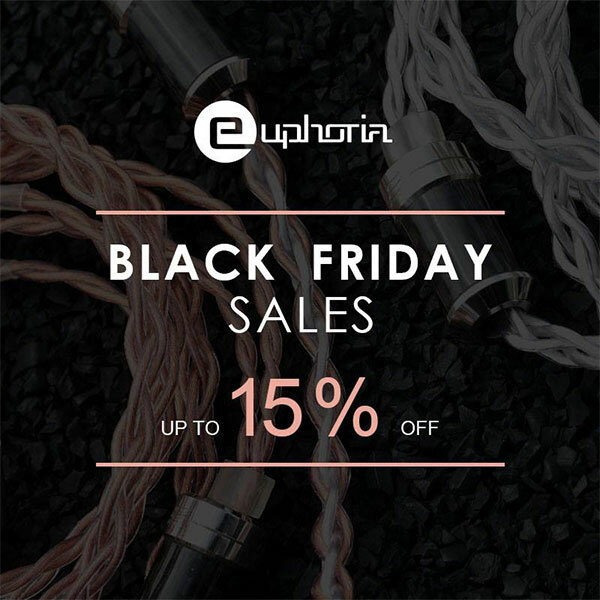 Euphoria in Singapore will be holding a BLACK FRIDAY & CYBER MONDAY promotion through the weekend covering some top-notch brands including Empire Ears, Vision Ears, Jomo Audio, and Effect Audio. The promo period starts 23rd Nov and will run until the 27th November and will include up to 15% off on selected product offerings from the key brands. You can read all our reviews on Vision Ears products here, Empire Ears here, Effect Audio here, and Jomo Audio here. 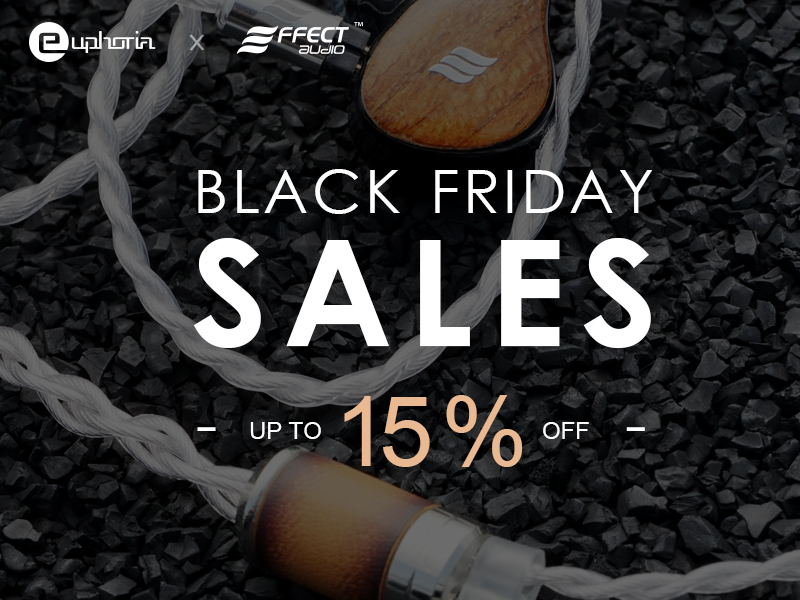 Closely aligned with Euphoria, Effect Audio is also having their own dedicated Black Friday sales with up to 15% off a range of cables. I am not exactly sure which ones as they have not released the information but do check on their website this Friday to see what they have on offer. You can read all our reviews on Effect Audio products on Headfonics here and start your shopping on the Effect Audio website here. 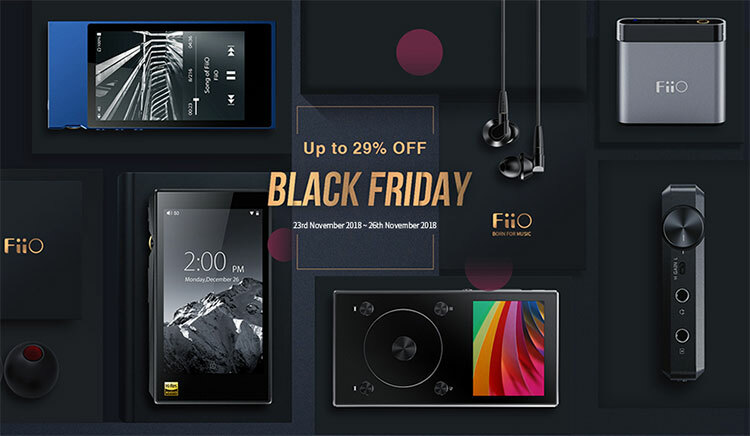 FiiO is offering two distinct types of deals for Black Friday 2018. You get a host of discounts on a wide range of products via their dealers in the US as well as direct with them on their Amazon online store. FiiO will directly offer special prices for F9 SE ($39.99), F9 ($86.99), M7 (at $174.99) and F5 ($51.99) on Amazon via their own storefront at https://amzn.to/2Q0kafo during the promo. For the dealer side, the list is just too long to mention each one individually but FiiO has kindly provided some links to the stores that will run the deals with a long brochure of the products they will be selling at a discount. Some of the deals via the stores include $59 off the X5iii DAP, $50 off the X3iii, $30 off the new M7 DAP, $30 off the A5 portable amp, and $15 off the F9 hybrid IEMs. Campfire Audio is doing some bundle deals for Black Friday and you can order right away rather than wait for Friday to come around. All IEM’s bought during the promo period quality for a free balanced Litz cable or a discounted premium cable upgrade. Quantities are limited so it is on a first come, first served basis. The discount is pretty strong at just $49.99 instead of $299 for the ALO Audio Reference 8 premium cable upgrade. The free balanced Litz cable is priced at $149 which is also a great bargain. You can read all our reviews on Campfire Audio products here and start your shopping on the CA website here. Ken’s ALO brand also has some tasty deals for Black Friday and Cyber Monday but you need to move fast as they tend to sell very quickly. Sweet deals include a free tube phono stage with every Studio 6 order worth about $1800 alone and the CV5 portable tube amp at just $399. You can read all our reviews on ALO Audio products here and start your shopping on the ALO website here. All Brainwavz Replacement Earpads – 25% off. You can find more about the Brainwavz gear we reviewed on Headfonics here. You can find out more about HiBy deals by clicking here as well as our HiBy Reviews by clicking here. Audeze is doing a Black Friday B-Stock blowout and it is happening right now so no need to wait until Friday. Stocks are limited to early birds get the worms! Some killer deals here including iSINE20’s for $299, the SINE DX for $279, and the LCD-2 Classic for $549. You can find more about the Audeze gear we reviewed on Headfonics here and start your shopping with Audeze here. Jerry and the team at JH Audio have a fairly comprehensive level of discounts on a wide range of products this coming Black Friday and Cyber Monday. Highlight deals include 20% the awesome Layla which we reviewed earlier this year and 15% of the Lola, Roxanne, and Angie. Take advantage of up to 20% off of the best custom earphones through Cyber Monday! Use code: BLACKFRIDAY2018 at checkout! 15% off Lola, Roxanne, 16v2, 13v2, Angie Custom IEMs PLUS Accessories* and Apparel! 10% off 3x, 10×3, 11 Custom IEMs. Also, save on Signature Designs Artwork and Carbon Fiber or Lightning Strike Carbon Fiber Full Shells. Free Enamel Pin with purchase of $100 or more, while supplies last. The discount applicable is for new orders only. Discounts cannot be applied to previous or current orders. Discount cannot be combined with any other offers or coupons. Offer not valid for Performance Series Universal IEMs, In-Ear Survival Kit, Premium Leather Goods, Moon Audio Silver Dragon Cable, and Comply Soft Wraps Plus. Discount prices available for end users only. Not available to distributors, dealers or resellers. You can find more about the JH Audio gear we reviewed on Headfonics here and start your shopping with JH Audio here. 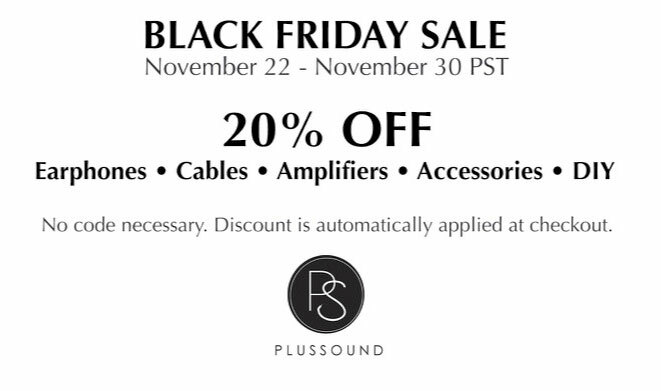 We have covered a few Plussound products and they do make excellent aftermarket cables so if you are in the hunt for a cable deal then we are pleased to report they do indeed have a Black Friday sale. Plussound have 20% off retail on all their products, including custom cables (both wired anBluetoothth), earphones, amplifiers, accessories, and DIY. The sale starts today (22nd Nov 2018) and ends on the 30th of Nov. No code is necessary as the discount will be automatically applied at the checkout. You can find more about the Plussound gear we reviewed on Headfonics here and start your shopping with Plussound here. Custom Monitor specialists Empire Ears are keeping is simple but effective for Black Friday through to Cyber Monday with a sitewide discount of 15% which you can apply at the online check out with the following promo code – BFSALE15. That means 15% off the likes of the fantastic Phantom which we recently reviewed as well as the Nemesis which Mike enjoyed recently. You can find more about the Empire Ears gear we reviewed on Headfonics here and start your shopping with Empire Ears here. Jomo Audio is offering a site-wide discount of 15% off with a discount code at the checkout. The code is BF2018 and applies to all products except the Haka, Jazz and Trinity models and in stock on the day. The promo period runs from the 23rd to the 25th of Nov so look sharp as it will all be over after Cyber Monday. 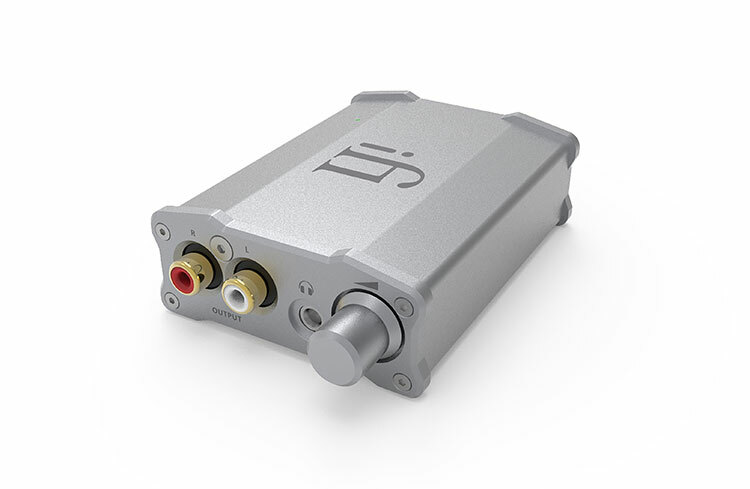 You can find more about the Jomo Audio gear we reviewed on Headfonics here and start your shopping with Jomo Audio here. If you happen to reside in Germany well you in luck because beyerdynamic are offering an enormous range of Black Friday sales. The list is as long as a really long thing going to a very long party in a rather long dress so get your wallet ready, it is that long. There are a total of 44 products on sale this year and the promo runs from Sunday, November 18th until December 2nd so it is happening now. Highlights include b-stock Amiron Wireless and Aventho wired at €100 off each, the Aventho Wireless at €130 off and the DT1770 b-stock at €210 off SRP. You can find more about the beyerdynamic gear we reviewed on Headfonics here and start your shopping with beyerdynamic here. You can find more about the RHA gear we reviewed on Headfonics here and start your shopping with RHA here. Noble is doing a site-wide sale and some freebies with purchases this Black Friday to Cyber Monday 2018, (GMT -5). You will get a free EDC Velvet with every purchase of an Encore and Katana plus 20% of all universal monitors and 15% off all custom orders, (excluding rush orders). 15 Black-on-Black Encores and 15 Black-on-Black Katanas are also being offered on a first come first served basis. The 20% off also includes the Pre-Launch sale of the Khan, Noble’s new flagship level universal IEM. You can find more about the Noble gear we reviewed on Headfonics here and start your shopping with Noble here. 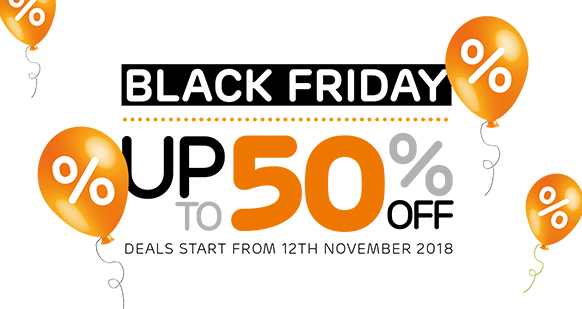 For those in Italy or fancy importin from Italy, UBSOUND is offering some Black Friday deals with 30% to 50% off on the entire products catalog. You can find the special deals directly on www.ubsoundshop.com (including worldwide shipment). The offer will finish on Monday 26th 11.59pm CET (end of Cyber Monday). You can find more about the UBSOUND gear we reviewed on Headfonics here and start your shopping with UBSOUND Amazon Italy here. For shoppers in the UK, Hifiheadphones have a pretty comprehensive line up of sales for Black Friday and Cyber Monday. In fact, they have been doing single day blowouts all this week so my suggestion is too there right now and see if they have a sale on now that interests you. 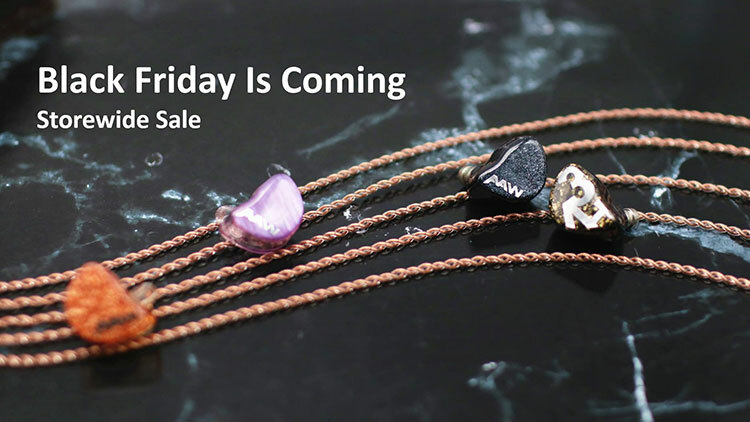 The one on Friday though promises to be their biggest one with a ton of brand names up for grabs at discounted prices. 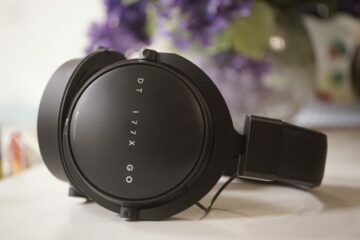 Their Megasale will have products up to 50% discount from brands such as Campfire Audio, Beyerdynamic, SoundMAGIC, Shanling, Westone and more. Every product in that category will be on sale from 23/11 to 26/11. 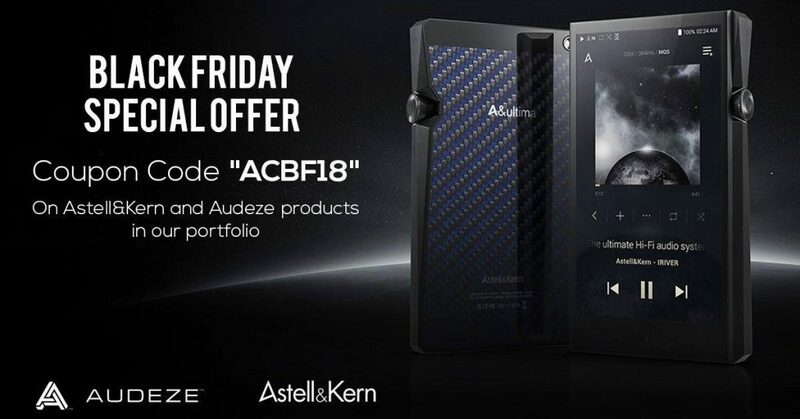 UK boutique audio supplier Audio Concierge are doing a special offer over the Black Friday weekend on all Astell & Kern and Audeze products on their website. The coupon code is ACBF18 and from what I can tell its about 10% off on most products but be careful, once applied you cannot change your mind and apply it to a different product. The coupon code is now active. You can find more about the AK gear we reviewed on Headfonics here and Audeze here and start your shopping with Audio Concierge here. iFi is doing just one deal as a “dip your toes” in the water of Black Friday madness 2018. This could be the start of a new trend for the UK audio specialists. One deal it may be but it is a good deal with the nano iDSD Light Edition (LE) on Amazon US being reduced to just $99. The price will change to $99 at midnight Friday EST so watch out for that because I suspect this will sell out pretty quick. You can find more about the iFi Audio gear we reviewed on Headfonics here and start your shopping with iFi Audio here when the price drops tomorrow. 64 Audio is doing a straight 20% and 15% off select products online starting from Black Friday through to Cyber Monday. They will be launching it on Friday Eastern Time. The 20% covers the likes of the Tia Fourte, U18t, and A18t and the 15% covers everything from the U12t and A12t downwards including the N8. You can find more about the 64 Audio gear we reviewed on Headfonics here and start your shopping with 64 Audio here. 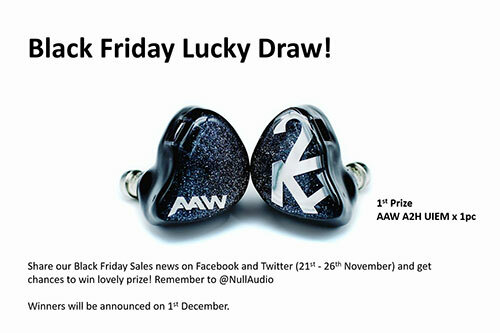 AAW and Null Audio have a lot happening on their site starting tomorrow (be patient guys). 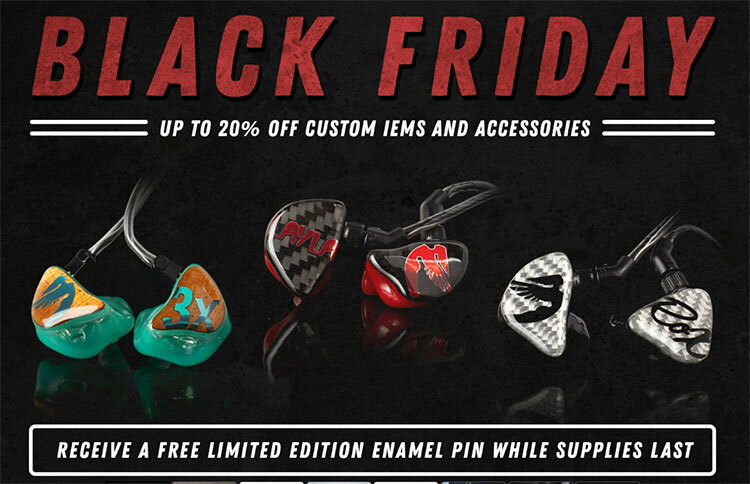 First, they have a 20% on selected IEMs and they will have that list ready for you on Black Friday. 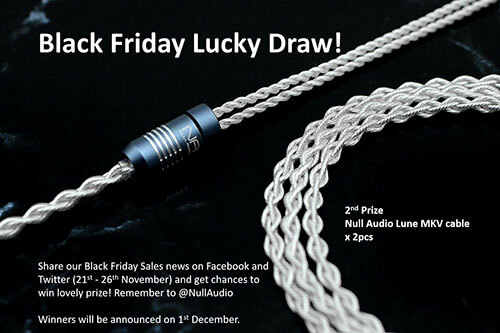 Also, on the Null Audio side they will also have 20% off on selected cables so have a look at both sites and not just one site. You can access all the sale info by clicking here. As well as their core sale they will be hosting 3 draws that you can participate in by sharing their BF deals and news between now and Cyber Monday on Social Media including Facebook and Twitter. Prizes include their new Capri iOS cable, the all-new AAW A2H universal monitor and a Null Audio Lune MKV cable which sounds pretty sweet. 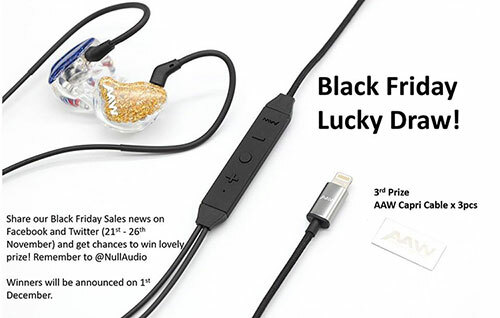 Just share via @nullaudio to be in with a chance to win. You can find more about the AAW gear we reviewed on Headfonics here and start your shopping with AAW here. IEM specialists, SIMGOT have a big Amazon sale on their IEMs this Black Friday through to Cyber Monday. All their IEMs and headphones are up to 30% off. That does include the MT3, EN700 Bass, Pro, and the new EM2 monitors. 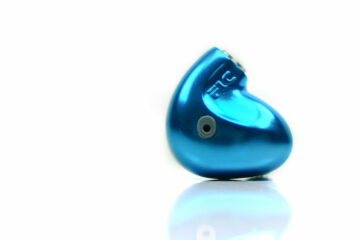 The EN700 Pro is a cracking budget dynamic driver IEM by the way and well worth a listen. You can find more about the SIMGOT gear we reviewed on Headfonics here and start your shopping with SIMGOT on Amazon here from midnight tonight. Good luck everyone and Happy Black Friday and Cyber Monday shopping 2018! Founder & Owner of headfonics.com. I first started reviewing in the late 80s (ouch!). Back then it was albums, rock concerts and interviews with a typewriter for the local rag. Now its desktop/portable and digital 2.1 audio on a rather nice laptop. How time flies.